In the past 2 weeks I noticed that on Microsoft download center Microsoft Security Essentials was re-published. But when I tried to install it, it stated that it was already installed, telling me it was the same version. Now it is published again and now it is a new version (build) 1.0.1959.0. Download and run it directly and it will upgrade. *Your PC must run genuine Windows to install Microsoft Security Essentials. Learn more about genuine. Watch videos to help you get the most from Microsoft Security Essentials. The most effective way to beat spammers at their game is to use the #1 anti-spam solution, GFI MailEssentials™. We have over 80,000 customers, worldwide, and have won over 60 awards. GFI MailEssentials features not one, but two anti-spam engines to give administrators an ultra high spam capture rate out-of-the-box with minimal configuration. Not only does it have one of the highest spam capture rates in the industry, over 99%, but it is also the market leader for reducing false positives and ships at the best price available. The latest version includes SpamRazer™; an additional anti-spam engine that provides a second layer of protection. It has been designed for ease-of-use and, due to frequent updates, SpamRazer needs no tweaking to be fully effective in filtering the latest spam attacks such as NDR spam, CNN spam, MSNBC spam and many more. Not only will administrators benefit from out-of-the-box filtering but also they will gain protection from each new attack without the need to tweak GFI MailEssentials. With SpamRazer filtering, IP reputation filtering, Bayesian filtering and other advanced anti-spam technologies, our spam capture rate is over 99%. GFI MailEssentials has a market-leading low rate of false positives, ensuring the safety of important emails. We will detect and block phishing emails as well as adding email management tools to your mail server including: disclaimers, mail monitoring, Internet mail reporting, list server, server-based auto replies and POP3 downloading. Why Choose GFI MailEssentials as Your Anti-spam Filter? Power when you need it, efficiency when you don’t. So goes the premise behind Lenovo’s new IdeaPad U550, a mid-size notebook with a CULV processor and switchable ATI graphics that could serve as both a desktop replacement, and a makeshift travel machine. Throw that together with a £521.98 price tag (as equipped) and the U550 makes an appealing pitch to computer buyers looking to make one purchase for all their computing needs. Can it follow through? We give Lenovo’s perfect porridge a taste test. 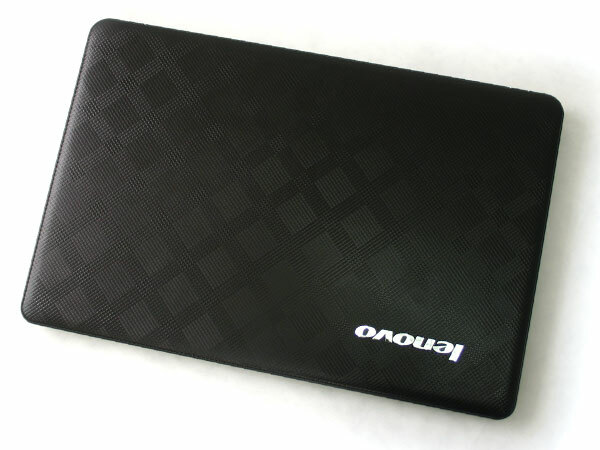 Patterns and texture have become a staple of the IdeaPad aesthetic, and the U550 is no exception. An extremely fine checkerboard pattern molded into the lid feels almost like the texture of knurled metal to the touch. Unfortunately, that’s about where the analogy ends. There’s no metal to speak of here, and a rap on the surface with a fingernail returns an cheap, hollow feel. And it is cheap. Closing the screen and carrying the notebook around, the lid bows visibly under the thumb. To its credit, the texture lends more visual appeal and resistance to fingerprints than a plain sheet of the same cheap plastic would, but we can’t abide by the otherwise flimsy feel of the whole display enclosure. Inside, the checkerboard carries over to a thin stripe at the top edge and a diamond crosshatch on the speaker grilles, but the rest has been left clean and smooth. The plastic has a silky feel in between the rubbery texture of a ThinkPad and the polished, almost sticky gloss of a Sony Vaio. It works. The same can’t quite be said of the bizarre vents cut into the bottom, which look like decorative woodwork from a Chinese restaurant. However discreet, they give the notebook a confused sort of styling that makes us think Lenovo designer’s still aren’t totally sure what and IdeaPad should look like, short of covering it in patterns. 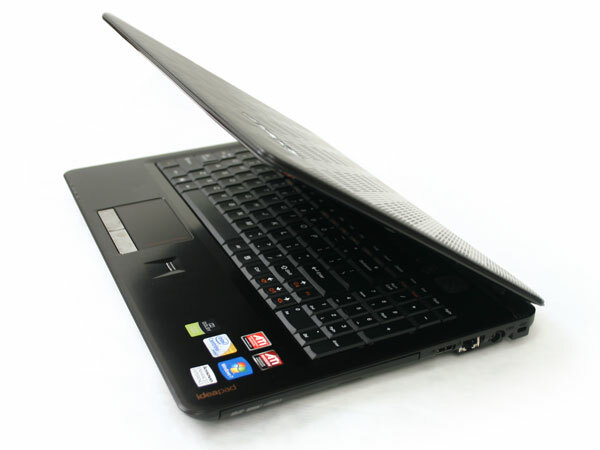 As a full-size laptop, the U550 comes equipped with the standard array of inputs and outputs you would expect on a notebook. No more, no less. The right-hand side offers a tray-loading DVD drive, a single USB port, Ethernet jack, and room for the DC power jack. Around the other side, you’ll find both VGA and HDMI connections for video, dedicated headphone and microphone jacks, and two USB ports, which are thoughtfully separated to front and back for easier access, and to prevent devices overlapping. The front has an SD card slot, a Wi-Fi switch, and a dedicated switch for activating and deactivating discrete graphics, which we’ll elaborate more on later. Buyers can order the U550 as cheap as £521.98 but at that level, you’re getting only Intel’s GMA 4500MHD integrated graphics. 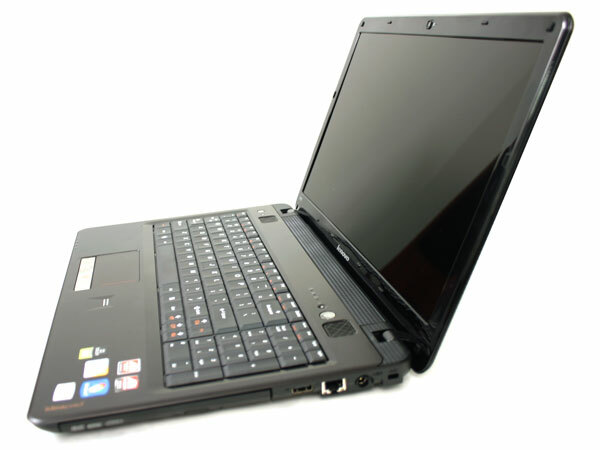 Our U550 came with the far more desirable ATI Mobile Radeon HD4330 and 512MB of dedicated RAM under the hood, along with 4GB of DDR3 RAM, a 320GB hard drive, 1.3-megapixel webcam, fingerprint scanner, and an 1.3GHz CULV Intel Core 2 Duo at the helm. Of course, true to the switchable graphics premise, the Intel GMA chip is still there and ready to play when you want to stretch the U550’s battery life for the long haul. Despite the relatively beefy 15.6-inch screen and substantial 14.8-inch by 9.9-inch footprint, the U550 weighs a reasonable 5.3 pounds. While that doesn’t make it the most outstanding globetrotter, most owners should have no problem tossing it in a backpack or messenger bag without breaking a sweat, and the power adapter – which is about the size of a Wii controller – will tag along nicely, too. The U550’s 15.6-inch display uses a rather low resolution, 1366 x 768 panel. That’s the same number of pixels Sony managed to stuff into the tiny 11.1-inch screen on the Sony Vaio X, which means it starts to look a bit stretched on this much, much larger screen. For desktop applications, like surfing and word processoing, that means a smaller sandbox to fit all your applications in. However, as we’ll see in the performance section, it also makes an otherwise mid-spec machine more viable for gaming. Unlike Lenovo’s immaculate business machines, IdeaPads seem to come burdened with just about every type of software imaginable. From Cyberlink Power2Go to Lenovo ReadyComm 5, the desktop has been strewn with over a dozen shortcuts to pre-installed clutter. Some applications, like Lenovo Idea Central’s “Decision Center,” actually serve as hubs to even more garbage, barraging you with offers for online backup solutions, identity theft monitoring programs, and more. Some of it is useful. Most of it isn’t. In either case, we wish Lenovo had moved confined it to a single folder on the start menu, rather than spreading it all over the system and even building it into utilities. As a matter of personal preference, we would probably just reinstall Windows rather than attempting to disassemble the junk pile Lenovo has heaped into this machine. Aside from feeling a bit generic, we have no complaints about the U550’s matte black keyboard, which makes good use of the notebook’s long form factor and even includes a (slightly condensed) numeric keypad. Backlighting would have made a nice addition, but most typists will find little or no learning curve. The same goes for the medium-sized touchpad: Its matte finish with subtle dimples elimates finger drag nicely, and a strip of orange dots provide a nice clue where pointing surface ends and scrolling surface begins. The 1.3-megapixel webcam built into the top of the display delivers acceptable picture quality for basic teleconferencing, but seemed to have a lot of digital noise even in well-lit situations, like an office, and colors seemed somewhat washed out and muted. However, it worked fine in conjunction with Lenovo’s own Veriface facial-recognition software for password-less logins. 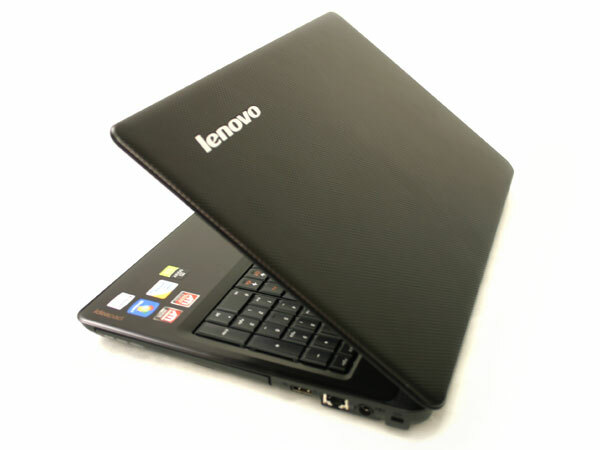 The Lenovo IdeaPad U550 uses two postage-stamp-sized speakers located above the keyboard, rather than the less practical down-firing arrangement (which can get pretty muffled when you use it in a lap). Together, they muster enough volume for a movie trailer and YouTube clip here and there, but like most notebooks, the complete lack of bass will have you reaching for earbuds as soon as it’s time for some music. Continuing with the trend we’ve seen in most Windows 7 laptops, our U550 went from power-on to desktop in a little under 50 seconds, and managed to pop open a browser window about 20 seconds later. Average, but acceptable, and we can’t help wondering if it wouldn’t be better without all the bloatware. After booting into Windows 7, switching from ATI’s Radeon to the power-saving Intel GMA chip can be done in about five seconds, which is an important aspect for any feature users will actually hope to take advantage of on the fly. A hard switch on the front of the notebook will switch the graphics manually after confirming with an on-screen OK, and also indicates when the ATI is blazing away with a white LED. You can also switch cards through software by right clicking and choosing “Configure Switchable Graphics.” Advanced options like automatically activating the Intel chip when running on battery power also make it easier to take advantage of power savings without investing much thought. However, keep in mind that all applications need to be closed prior to switching, so the process can be more tedious if you’re already wrapped up in something (nowhere near as bad as Apple’s MacBook Pro, though, which requires users to actually log off OS X and back in). Around the desktop, users won’t notice all that much of a difference between the U550 running on four cylinders or running on eight. Even HD YouTube video and high-quality 480p content from Hulu played well without invoking power of the ATI. Fire it up, however, and you open up a whole new level of performance. Like most hardware, we pushed the ATI to its limits with Crysis, which remains one of the most demanding PC titles available, even in 2010. With the game set to match the display’s native 1366 x 768 native resolution, it yielded perfectly fluid motion with all settings on low. Frame rates consistently remained in the lower 30’s and upper 20’s, although some brief moments of action or other intense effects could push it into the teens. Stepping everything to medium immediately dropped frame-rates unacceptably low, but players who want more compelling visuals should be able to bump certain settings up with the headroom available, without damaging playability. Running PCMark Vantage, the U550 hit a score of 2905 PCMarks, a bit under similar laptops like Sony’s Vaio NW, which achieved 3,142. 3DMark Vantage refused to run on the system, but 3DMark06 returned a score of 2,653 3DMarks. That’s nothing to brag about in gaming circles, but considering it’s using a CULV processor and still deals with Crysis at minimal settings, we would say the U550 could make a fair-weather gamer happy enough. What difference does all that swapping make in battery life? A fairly significant one. With GPU on and brightness all the way up, you can expect about three hours on the desktop, and of course, significantly less once you start tearing away at games. Switch to the Intel GMA chip, and that number soars to five-and-a-half hours, which should make all the difference for extended trips away from outlets. 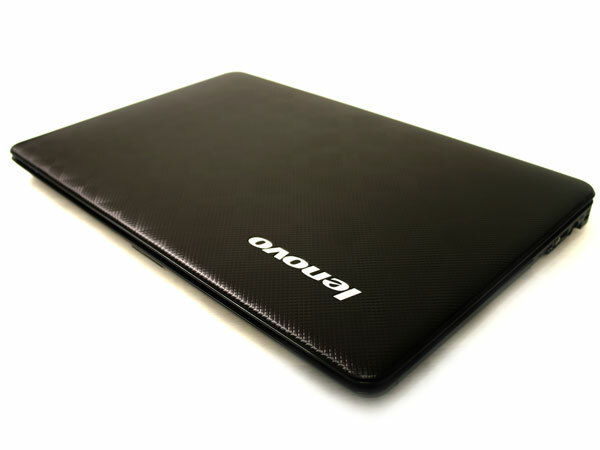 As a do-it-all notebook in this price range, you could do worse than Lenovo’s U550. But where other notebooksstand out by paying attention to the details, Lenovo earns itself demerit after demerit by rummaging through the bargain bin in places it doesn’t think we’re looking. Cheap materials and confused styling make the outside something to be tolerated more than appreciated, and a low-resolution screen and pile of cruddy software waiting on the desktop for new owners carries that cheap feeling right over to the inside. The power and flexibility of switchable ATI graphics coupled with a CULV processor provide some redemption in both performance and battery life, but you’ll have to look past the rough edges to appreciate them.